The bad news continues to roll in for the Colorado Rockies. Not only did they suffer their fifth loss in six games tonight, and fall behind the Arizona Diamondbacks in the NL West standings, but they have learned that Jorge De La Rosa will out until at least next June thanks to a torn elbow ligament that will require Tommy John surgery. You read that right, De La Rosa will be out until at least next June because Tommy John surgery requires a minimum 12 month recovery period. Washington Nationals phenom Stephen Strasburg had the surgery last August and is not scheduled to be back on a mound throwing until after this season is completed. It is entirely possible that the Rockies may not see De La Rosa on the mound until after next season’s all-star break. The injury to De La Rosa comes at a bad time for both him and the club. For one, he was the only left handed starter in the rotation. For another, De La Rosa was on his way to career best season. His ERA before the injury this season was under 4.00 for the first time in his career (his previous career best was 4.22 last season). His strikeout to walk ratio of 2.36 this season is also a career best. 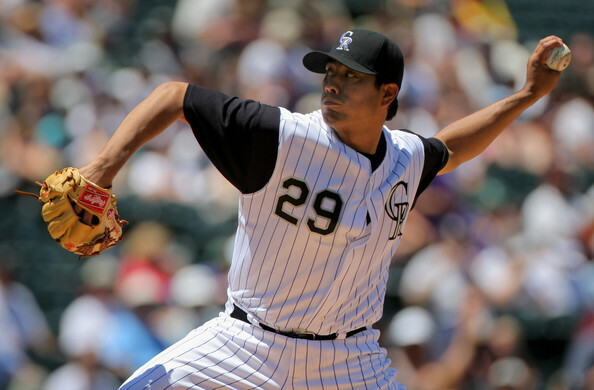 Simply put, De La Rosa has been the Rockies’ most consistent starter in 2011, much more so than ace Ubaldo Jimenez. Starting pitching overall has been a strength this season for the Rockies, but it remains to be seen if it will continue to be so without De La Rosa. The good news is that Aaron Cook is due to return to the club next week following a spring injury, so that will help, but it remains to be seen if he can be productive right away while he adjusts to a return to the majors. Perhaps one of the young pitchers, like Clayton Mortenson or Greg Reynolds, can take advantage of the opportunity to prove themselves and entrench a spot in the rotation. Of course the Rockies can’t afford to feel sorry for themselves. The Cardinals lost ace pitcher Adam Wainwright for the year during spring training, and they have managed to overcome that, holding down the lead in the NL Central. The Rockies still have enough talent to compete in the division and perhaps even win the thing, but the injury to De La Rosa is another hurdle the Rockies have to overcome. To do so, the offense needs to be a lot more consistent (tonight’s 2-1 loss being a perfect case in point for that), Jimenez needs to start showing the form from early last year (his last two starts have been very encouraging, including a complete game effort in Milwaukee in Sunday), and the rest of the rotation needs to keep doing what they’ve been doing (it’s not Jason Hammel’s fault he only had one run of support tonight).